It’s been said that when we fall in love we become the best versions of ourselves. And as Academy Award nominated Downfall filmmaker Oliver Hirschbiegel reveals in Diana, the Princess of Wales turned “People’s Princess” was no exception. Even though she did her best to keep her love life post-Charles a secret from the tabloid press and international paparazzi that followed her whenever she left the palace, the world noticed an undeniable change in Diana during the period of 1995-97 as she began to grow much more confident from the way she carried herself to her dealings with the media. Whether it was speaking up about the horrors she endured in a marriage with a man who was openly in love with someone else or the horrors facing humanity on a global scale, Diana was no longer content just going to parties and posing for the blinding light of flash bulbs that stalked her from all directions on the street as well as the red carpet. 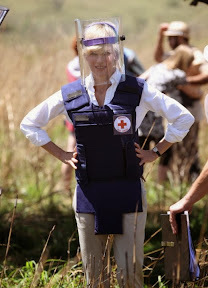 As Diana (sensitively portrayed by Naomi Watts) told physician Hasnat Khan (Naveen Andrews) when she first met the charismatic heart surgeon, she just wanted to help people and undoubtedly inspired by Khan, she began doing just that around the world. Although she’d been a beacon of hope on behalf of AIDS awareness for years, Diana’s work campaigning about the dangers of landmines reached its peak during their relationship as captured in the film. Inspired by their successfully hidden romance, which some biographers (including the one upon which the movie is based) referred to as the last great love of Diana’s life before her untimely death in a high-speed crash in Paris when she was hounded by photographers in a dangerous pursuit, Hirschbiegel’s unfairly maligned production is based upon the nonfiction work by Kate Snell. Adapted by award-winning playwright Stephen Jeffreys to uneven effect, Diana tries to bring us into her private world but despite the rich production design, costuming and strong turns by the ensemble cast, the attempt never feels one hundred percent genuine. At its best when it focuses on the couple as they begin to get more serious about one another and try to make their relationship work despite all of the obstacles in the way from gender politics and power struggles to the press and familial obligation, Diana has its strengths despite some poor decisions made in the execution of the narrative. Bookended by the last night of her life, Hirschbiegel takes a wrong turn by giving Diana a sense of ominous premonition, highlighted on the soundtrack by a dissonant roar as she makes her way down the hall, toward the elevator and to the car that would eventually crash. A cinematically self-conscious choice that seems like it belongs in a different Naomi Watts picture – more specifically, David Lynch’s Mulholland Drive – thankfully, that’s the last Avante-garde tactic employed in the otherwise mainstream approach. Augmented by the authentic art direction, the Blu-ray release offers a collectible booklet that zeroes in on Diana as a fashion icon and the costuming decisions made in the film. 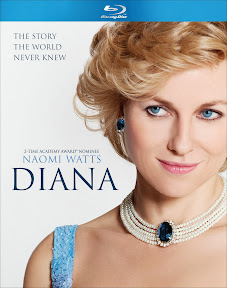 At best Diana ranks alongside average made-for-cable movie fare that’s been infinitely classed up by a great, understated turn by Naomi Watts. Predictably yet quite unreasonably, Watts was slaughtered by the critics in Diana’s homeland who probably felt that nobody would’ve been good enough to play their royal, with one reviewer even going so far as to ridiculously surmise that Wesley Snipes in a blonde wig would’ve been more convincing than this terrifically talented Oscar nominee. Needless to say, while you do wonder if some of the film critics tackling the movie only rated it by the poster and/or trailer, in the end, the best judge of its success is the viewers themselves given the large amount of bias endured by Hirschbiegel’s film. While it’s an overall intriguing look at a period of her life that hasn’t been this thoroughly documented in other biopics, the clunky screenplay hinders the film greatly and raises far more questions to which they provide answers in the process such as why some of her causes called to her on such a personal level, besides her first act blanket statement that she wanted to help. This being said, I applaud the scenes of her courage more than say some of the dubious ones earlier into the film that focus on their initial courtship through a romantic comedy lens. Yet by presenting her as a woman with flaws as well as great strength, Hirschbiegel and company ensure that we feel more invested in her journey with Hasnat and the way that their love transformed both of them, even if sadly because we know how it all works out, it’s missing some of the emotional investment it otherwise would’ve inspired. Nonetheless just like love makes everyone a better version of themselves, seeing a film about such a internationally beloved woman in love helps Hirschbiegel’s film present the very best version of itself, particularly in this lushly transferred Blu-ray release.